Small Group Leader TIP of the Day: Before you prepare your lesson plan, prepare your heart! Small Group Leader TIP of the Day: Keep your eyes on your group members, not on your study guide. SG Leader TIP of the Day: Use 80-20 rule when leading discussion. You talk ~20%, incl. questions. Rest of group ~80%. SG Leader TIP of the Day: A good shepherd is a shepherd-developer. Share ldrship, b/c many more sheep need a shepherd. SG Leader TIP of the Day: Be a good shepherd. Know where sheep are spiritually. Spend time w/ each. Ask questions. Care. 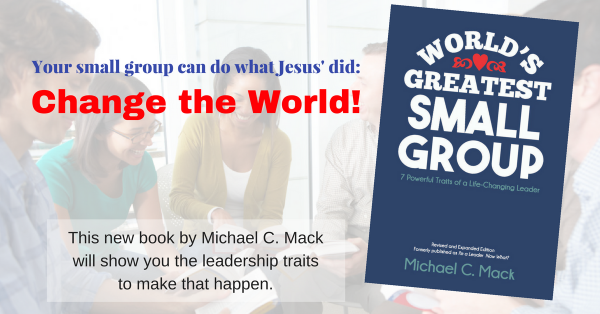 Next article For Bloggers and Reviewers: Can Your Group(s) Really Do What Jesus’ Did—and Even Greater Things?